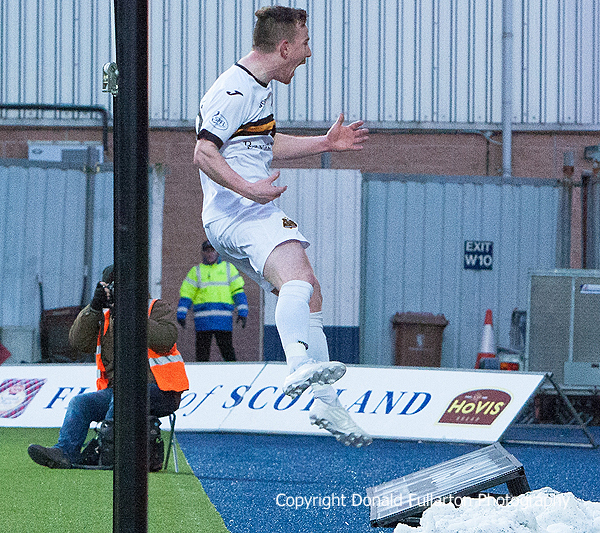 DUMBARTON returned to form with a battling draw against the SPFL Championship's form team Falkirk. DUMBARTON returned to form with a battling draw against the SPFL Championship's form team Falkirk in front of 3,500 freezing fans at the Falkirk Stadium. After a four game barren spell Sons, fielding new on-loan signing Darren Petrie from Dundee United, showed real spirit throughout an end to end contest. They opened the score on 19 minutes when full back Scott Taggart raced in at the back post to knock home a cross. But at the other end the visitors had a lot of defending to do. Two minutes later Craig Sibbald equalised for Peter Houston's side, and they went ahead shortly before the interval with a Luke Leahy goal. Home fans anticipating more goals from the Bairns after the interval were shocked when the next two goals were scored by Dumbarton. First Darren Petrie shot home a loose ball in a packed penalty area, then Archie Campbell (pictured celebrating) found space in the box to net the third goal. However the home side battled on, and they levelled the score at 3-3 in 80 minutes when their sub no.9 David Smith netted. Both teams strived for a winner, but the final whistle blew to give both sides a deserved share of the points.